For the final race of 2013, I registered for the inaugural running of the Phidippides 5K. Phidippides was the name of the legendary Greek runner who ran from Marathon to Athens to bring news of a Greek military victory (and tragically, died upon delivering the message). Phidippides is also the name of a venerable running store in midtown Atlanta, founded by Jeff Galloway, who represented the USA in the 10,000 meter race in the 1972 summer Olympics in Munich. Galloway is one of Atlanta’s best-known running gurus, and has brought considerable publicity to the Peachtree Road Race on Independence Day, to make the Peachtree the world’s largest event in the 10K distance. I didn’t learn of the race route until a few days ahead of time. The race would be run in the same general neighborhood as the Uptown Rhodes Race, but for the most part the streets would be different, and this would be a substantially different race. I had a chance to check in advance the elevations of the route using a new app, which was helpful in planning my strategy for the race. The race would begin at 285 meters elevation, rising to 291 meters in the first half-kilometer, then over gentle hills to gradually drop to the low point of 250 meters near the 3 km mark. It was quite valuable to know in advance that the fifth kilometer would feature a rise to 266 meters, before the final downhill stretch on Piedmont Road to the finish at 255 meter elevation. 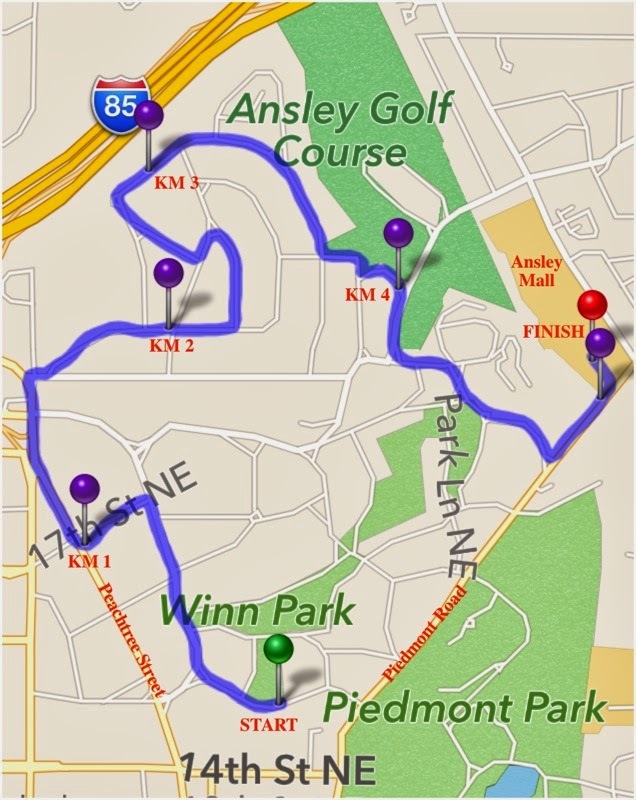 The map shows the route that was run, recorded by GPS on Runhelper. To the start: The weather reports for the day had been consistently ominous – the first appearance in the 10-day weather forecast predicted a 100% chance of rain for Saturday, and the forecasted chance of rain remained stubbornly high as the race day grew nearer. Upon awakening on race morning, it was still dry at home, but as I left the house at 7 am, the first drops of drizzle speckled the windshield, and the rain steadily increased as I drove into Atlanta to the designated parking lot near the finish line, in Ansley Mall. While staying dry in the car, I pinned on the race bib onto my water-resistant running jacket, looked over the race route map one more time, and then at 7:35 am stepped out of the car to join a small group of runners gathering at the southeast corner of the mall, staying dry for as long as possible under the protective overhang of the mall. At 7:45 am, the runners began to make their way to Piedmont Road for the 10-minute walk to the starting line, on 15th Street. Upon arriving, I saw about 100 people, perhaps a few more, but well short of 1000, and took a starting position in the center of the relatively small group. I was wearing the hood of my jacket to keep my head dry, but as a result I could hardly hear the announcements. I was watching the time, and as the clock ticked to 8:00 am sharp, the group suddenly moved forward through the starting gate. The first kilometer: With a relatively uncrowded field, I was able to get off to a quick start, and was immediately in a comfortable pace in the first gentle uphill section to the highest elevation of the race. However I quickly discovered that either I could not hear the Runhelper alerts, or perhaps I had accidentally silenced the phone when I was slipping into the protective jacket of the arm band. Fortunately I was able to see the time with quick glances whenever I wished to, and I had sufficiently studied the route so that I would be familiar with my general progress by landmarks and street corners. 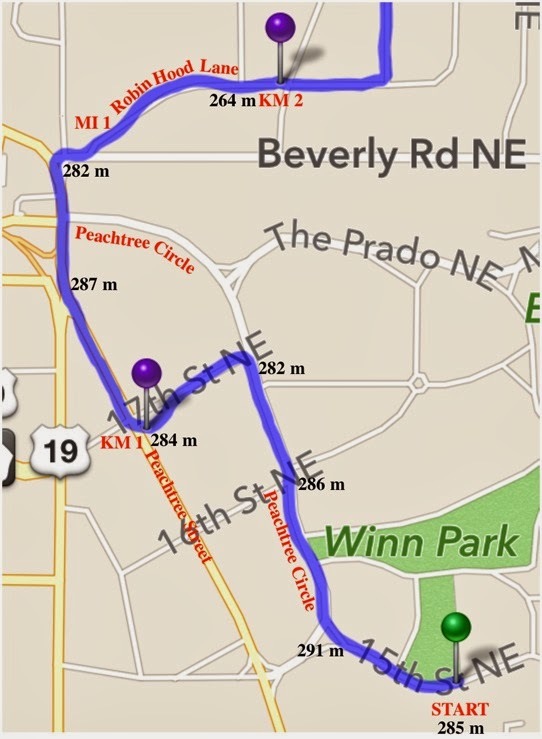 We curved right from 15th Street onto Peachtree Circle, then quickly to the left turn onto 17th Street, to finish the first kilometer at the corner with Peachtree Street. I had a sense that I had a very good start, which was confirmed later when I checked my time with RunHelper at 4:47 for the first kilometer. The second kilometer: Proceeding northward on Peachtree Street, I was keeping pace with the other runners ahead of me. It appeared that the rain had virtually stopped, and the hood was bouncing around uncomfortably on my head. (Next time I will wear a cap!) I decided to pull down the hood, and after the first sensation of the wet air on my ears, I felt comfortable enough to run bareheaded. The stretch along Peachtree was easily managed and I focused on keeping up a good pace, three footfalls per second. Passing Peachtree Circle, I made the turn onto Beverly Road, and then the diagonal left turn onto Robin Hood Lane. This marked a nice downhill stretch into the neighborhood known as “Sherwood Forest”, and I was delighted to hear from the volunteer at the one-mile mark call out my time at “7:45” as I passed her! Going downhill, I was tempted to lengthen my stride to pick up some speed, but the pavement was wet and so I elected to proceed with a little caution. I also remembered my plan to keep a little energy in reserve for the tougher section later in the race. I finished the second kilometer in 4:48, 9:35 total time elapsed. 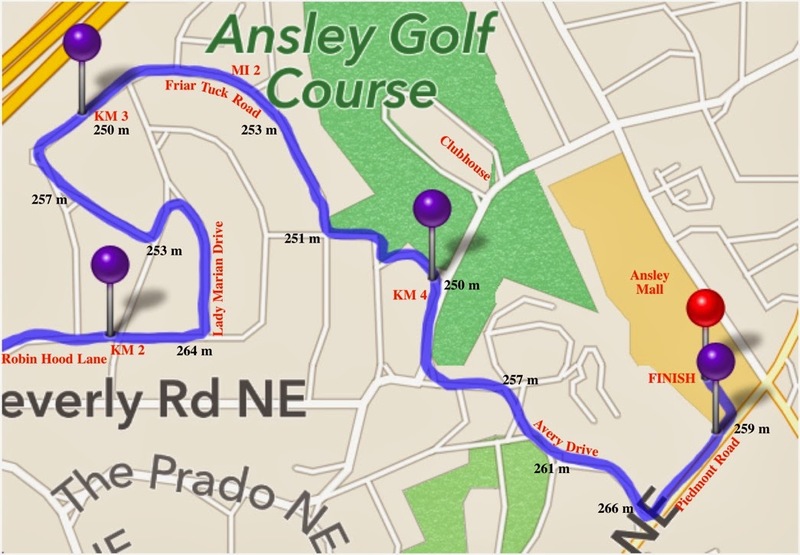 The third kilometer: The race continued on level or mildly downhill roads, turning left onto Lady Marian Drive. There were a couple of sharp turns winding onto Doncaster, Pembroke, and Barnesdale Way, which turned into Friar Tuck Road more-or-less at the 3 km mark and the lowest elevation of the race. I was conscious that this would be the last “easy” part of the race, so despite feeling the first bit of fatigue, I focused on picking up my knees and keeping up with the runners around me. From a quick glance at my iPhone, I saw that my time was less than 15 minutes at this time, at which I was elated! From Runhelper: 5:04 for the third kilometer, and 14:36 elapsed. The fourth kilometer: Friar Tuck Road was very gently rolling, and not too difficult except that I had run three kilometers to this point. We passed the monitor at the two-mile mark, who called out “16:02.” As I smiled and thanked her, I realized that I might finish in less than 26 minutes if I didn’t slow down much more, and that spurred me on with redoubled purpose. As we reached the fairways of the Ansley Golf Course, I could see the clubhouse to my left. I was focused solely on making the turns as tight as possible, without cutting short any turns, yet trying for the shortest pathway between each pair of corners. 5:28 for the fourth kilometer, and 20:03 elapsed. The fifth kilometer: My preparation has centered on being aware of an overall uphill stretch for the better part of this kilometer. Fortunately the hills did not seem to be too steep, or perhaps I’m in better shape now compared to one month ago, but I felt that I was keeping up with the other runners. Although I could hear footsteps behind me from time to time, I was not passed very often, and never very quickly. In fact I found that I slowly passed a couple of people who were not prepared for the uphill section. The road became Avery Drive, still gradually uphill, but I knew that I was in the final kilometer and that kept me moving forward. As I neared the top of the hill on Avery Drive, I suddenly I heard the sound of traffic on Piedmont Road and simultaneously saw the first glimpse of a building on the other side of Piedmont Road, just 100 meters away. The hardest part of the race was over! To the finish: I slowed down a bit to make the sharp left turn onto Piedmont Road, and admired the downhill straightaway before me, with only about 250 meters to go. My legs were tired but I was resolved to finish strong. I pushed myself to accelerate, and to my delight I could tell that I was gradually picking up speed. The downhill was perfect in that I could confidently take advantage of the slope without worrying that I might fall. I crossed the railroad right-of-way, and saw some shops to my left followed by the entrance to the parking lot for Ansley Mall. I turned left into the lot, and was greeted with the welcome sight of the clock at the finish line showing 25:45. Less than 26 minutes indeed – if I hurried! So with every last bit of effort remaining, I raced as hard as I could manage, past the people lining up both sides of the last 25 meters; someone called out “Strong finish!”. I saw 25:55 as I moved under the finish line (official time 25:56.8; 5:49 for the last kilometer) and allowed myself a small fist pump with the right hand. I gradually slowed down, walked around for a few minutes, then picked up a banana, passed up the coconut milk in favor of hot coffee, and indulged in a delicious bagel and cream cheese to replace a few of the calories burned. Hooray!! The promised personal record was achieved! Overall I placed 58th out of 164 finishers, and fifth out of the seven men competing in the 50-54 age group. Most of the casual runners had stayed home, but I was very pleased with the improvement in my time! And it didn’t really rain at all while we were racing, so I was very glad that I came out for the race despite the bad weather. Goal: To finish in less than 27 minutes: Achieved!